Albrecht Durer was an extremely versatile and gifted German artist from the Renaissance period. He was a brilliant draftsman and writer as well. But his greatest impact was in the domain of printmaking. Durer worked as an apprentice to his father, a goldsmith, and with local painter Michael Wolgemut who produced woodcut illustrations for books and other printed matter. Durer is credited to have revolutionized printmaking, elevating it to an art form. Let’s take a look at the Albrecht Durer biography, some interesting facts about the artist, and some of his famous paintings and prints. Durer was born in Nuremberg in 1471, and was one of the 18 children of his parents. He was named after his father. He showed early talent when he painted a self-portrait in 1484. Durer depicted himself as a chubby wide-eyed boy. It’s widely considered one of the earliest surviving self-portraits by a European master. Durer was an extensive traveler. He picked up clients and inspirations wherever he went and was fascinated by the works of Giovanni Bellini and Andrea Mantegna. Durer traveled to Basle, Frankfurt and several other places. He won acclaim in Italy in his later years and is largely credited of introducing Renaissance in northern Europe. The Albrecht Durer prints are probably the best of their kind ever made. His oeuvre of work includes altarpieces, portraits, and devotional imagery. But his pioneering engravings and woodcuts have won the most reputation over the centuries. Adam and Eve is perhaps his most famous, which captures the couple before Fall. In a 12-month period between 1513 and 1514, Durer created his trio of master prints called Meisterstiche. These were three solitary figures in symbolic environments and are an important part of the Albrecht Durer biography. The works were titled St Jerome in His Study, Melencolia I, and Knight, Death, and the Devil. He drew inspiration from other masters to come up with these works. These went on to be a major part of the Albrecht Durer biography. Durer, courtesy his growing social stature, became the court painter to Maximilian I in 1512. He was commissioned to complete the iconic Triumphal Arch to be displayed across the country. It comprised various scenes that glorified the emperor’s military achievements. Earlier, in 1509, Durer was included in the Great Council of Nuremberg. It was around 1520 that Portuguese adventurers brought a rhinoceros from India to Europe. Durer never saw it himself but produced a woodcut image of the animal from public hearsay and based on a sketch made by a Lisbon-based German merchant. There were several fanciful additions to Durer’s image, including the folds on the skin which resembled an armor. It’s a very important work in the Albrecht Durer biography. The Albrecht Durer biography would be incomplete without a mention about his signature. It was perhaps one of the earliest instances of branding. Around the mid-1490s, Durer started putting his initials on his works. The AD monogram soon became esteemed and valuable. He even took Marcantonio Raimondi of Bologna to court for attempting to copy his work. Durer, in his final years, was an equally famous author. He published his first book, Instructions for Measuring with a Compass and Ruler, in which Durer discussed at length the matter of perspective. Durer believed, art wasn’t merely a humble craft, but a rather lofty achievement which is built on theoretical foundations. He spent most of his later years writing on art than creating it. Durer died in 1528, probably from a bout of chronic malaria. Some of friends, it’s said, exhumed his body and made a plaster cast of his hands and face. A strand of his hair was cut while on deathbed and was sent to Strasbourg like the relic of a saint. It’s now kept in the Vienna Academy of Art in a silver-bound reliquary. As mentioned earlier, Albrecht Durer did a self-portrait in the early 1500s which went on to become one of the most notable works of the painter. He chose a pose which directly faces the audience. Durer, in the picture, presents himself in a monumental fashion. His pose in the picture was typically reserved for paintings of Jesus Christ. The symmetry and dark tones, and the hand gesture of the artist, are only found in religious portraits in the era. The Young Hare is widely regarded as one of the best Albrecht Durer drawings and an incredible example of observational art. It’s one of the earliest masterpieces that dealt with natural studies. The famous painter masterfully captured the animal with photographic accuracy and the picture was strikingly lifelike. It was a difficult subject to paint, particularly considering the multi-colored texture of the animal’s fur. The painting is a detailed rendition of the hare. Durer was fascinated with the perfect human form and its proportionate representation on the canvas. The subject was hugely popular in Italy during the Renaissance. Durer, towards the end of his lifetime, wrote several books on the subject where he outlined his theories in this regard. In the painting, Adam and Eve rest their weight on one leg, while the other limb is bent. Each has one arm angled upwards. Most art experts consider the Praying Hands as the best-known work in the Albrecht Durer biography. The drawing is very simple and done with ink on a blue paper. It depicts two male hands in an act of prayer. Durer had completed it as a sketch for a painted altarpiece. But it was destroyed in a fire in 1729. 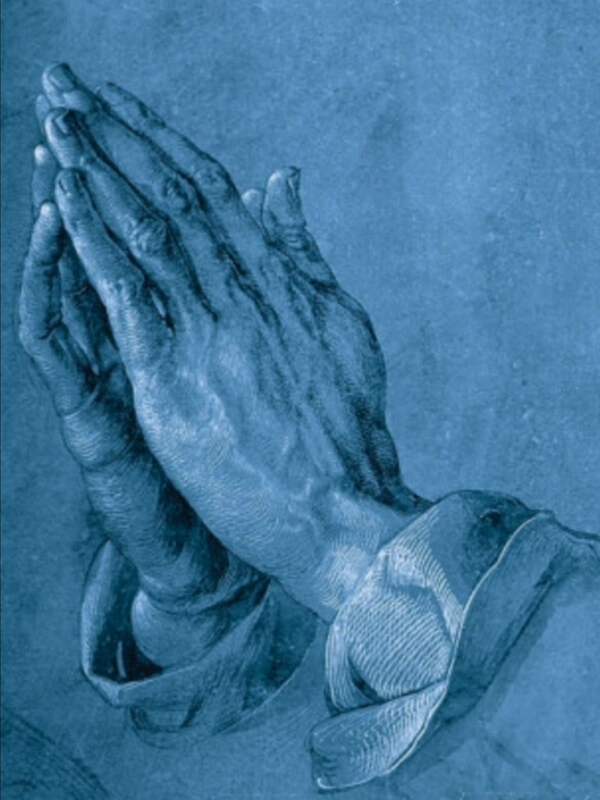 Now in the modern era, Durer’s Praying Hands is considered as an international symbol of piousness and is one of the most respected artworks of its kind ever produced. 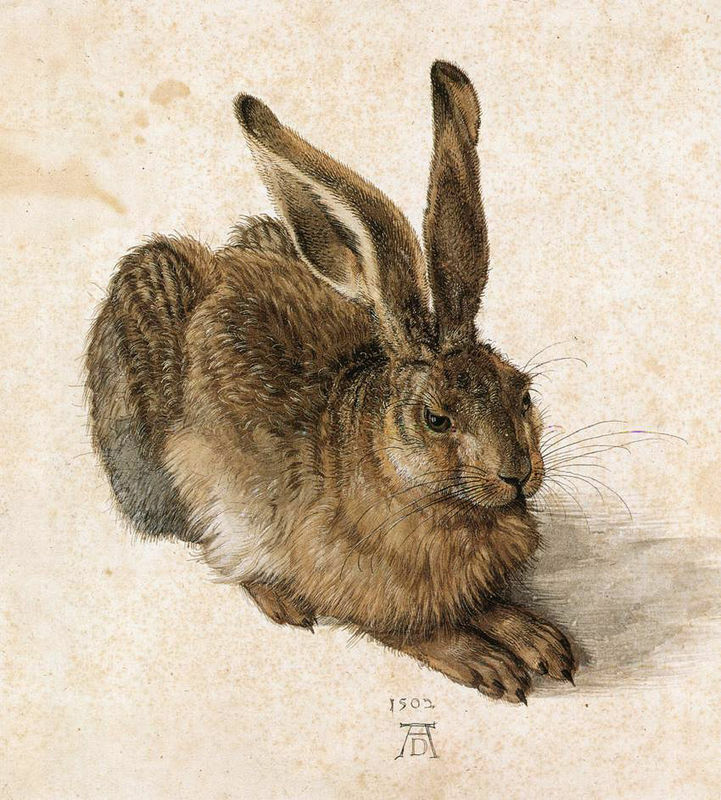 Much like the Young Hare, the Great Piece of Turf is a landmark work in the Albrecht Durer biography. It’s widely acknowledged as a masterpiece in natural studies because it came at a time when realism was yet to make its mark on illustrations. Durer, in the painting, meticulously depicts a collection of some commonly seen plants that include the leaves, buds, and the roots. He spared no details in the picture. Some of the identified species include yarrow, dandelions, and daisies. Durer completed Saint Jerome in His Study in 1514. It shows the scholar-saint sitting at a desk and engrossed in his work. Saint Jerome in His Study is a copperplate engraving and is replete with symbolism. At the corner of Jerome’s table is a cross which represents resurrection, while on the left is a window sill. On it rests a skull which symbolizes death. There’s a lion in the foreground which represents the traditional Saint Jerome iconography. The dog represents loyalty and is a recurring creature in Durer’s works. The Four Apostles, also known as the Four Holy Men, is among Durer’s last major work. It’s a panel painting which Durer completed in 1526. The painter had returned to his hometown Nuremberg by that time. He donated one of his works to the city council as a mark of respect which would serve as a good governance example. This was a common practice among Italian artists. He did a larger-than-life drawing of four apostles. This one is a small portrait kept in Florence’s Uffizi Gallery. It’s one of the earliest surviving works of the painter and was completed in 1490. He was only 18 at that time. The painting shows Durer’s father, Albrecht the Elder, in his early sixties. The artist later described his father as a “Honorable, Christian” man. A similar painting of Durer’s mother Barbara Holper is kept in Nuremberg. Towards the end of the 15th century, the German painter traveled to Venice. He came in contact with prominent artist Giovanni Bellini and was deeply influenced by his work. The Virgin’s pyramid structure, the aesthetic-looking Christ child, the red and blue colors, is reminiscent of Bellini’s works on the same subject. There’s a small coat of arms at the lower left corner to symbolize the wealthy Haller von Hallerstein family of Nuremberg. This oil painting by Durer was commissioned by Frederick II for All Saints’ Church, Wittenberg, Germany. 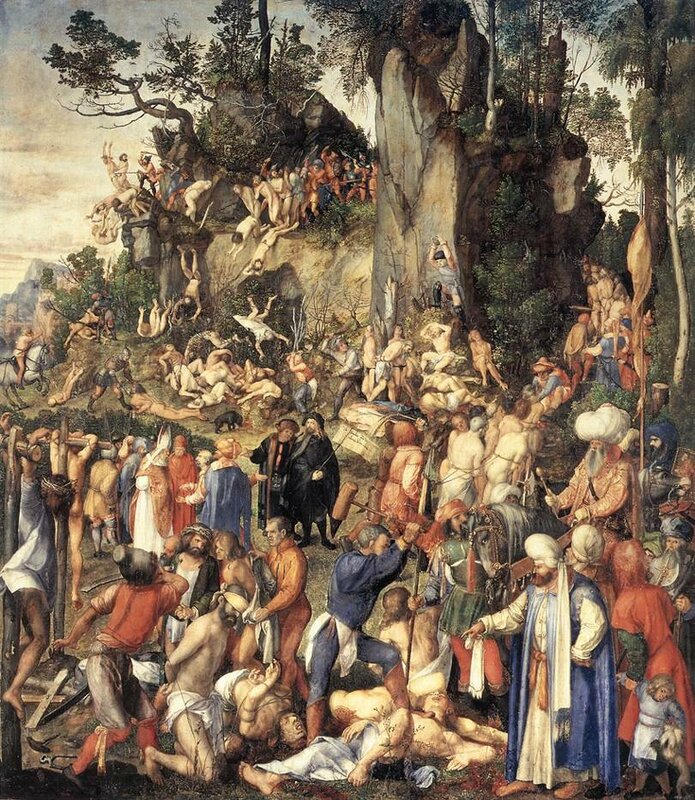 The altarpiece depicts the legend of 10,000 Christians killed on Mount Ararat by Persian king Saporat on instructions of Roman Emperors Antonious and Hadrian. 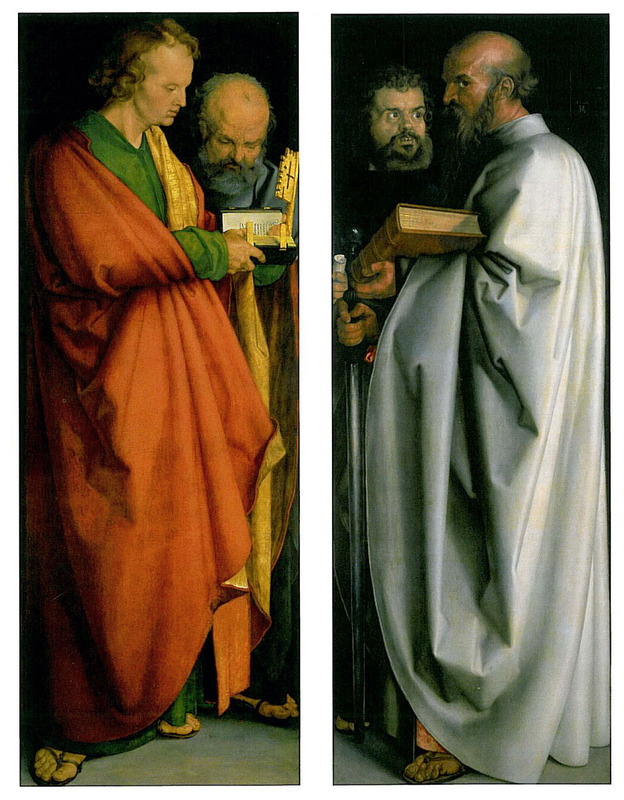 This was the first painting in the Albrecht Durer biography that tackled so many figures in a single work. Durer himself appears in the painting, dressed in black and holding a staff.